And now we are informed that the doctrines of Christianity are responsible for "gay marriage". The suggestions don't only sound ludicrous, like most such convoluted thinking, they ARE ludicrous. 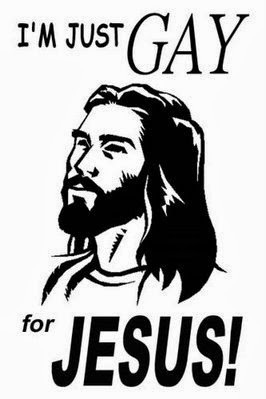 This article appears wont to celebrate Jesus as "the Gayest Deity Ever! ", promoting the "democratic" principle of universal human equivalence and interchangeability to create a rationale for homosexual behavior. After all, we know that Jesus mostly hung out with a bunch of guys, and talked all the time about "love". So he must have been a "gay" advocate! The only problem seems to be that it has very little basis in reality. The emphasis appears to be trying to persuade that social normalization and acceptance of homosexual behavior is inevitable. Ignoring the fact that this appears rather as a propaganda effort popularized in the media, lacking general popular support. The efforts to legalize "gay marriage" have been turned down everywhere in the democratic process, the "cause" only forwarded by legalistic judgements and force.